First, we need to know how this whole debate about the existence of a lake on Mars originated. 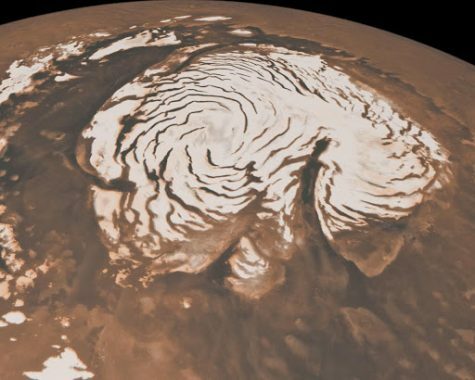 One of the Mars orbiters detects a large quantity of water underneath mar’s south pole ice field. In the past, there were very little amounts of liquid water on Mars, but it was nothing compared to this. The newly discovered lake is about 20 kilometers in diameter and is under 1.5 kilometer of solid ice. You may ask how the water underneath 1.5 kilometers(0.932057 miles) of ice remain liquid. The water will need a lot of thermal energy to heat the air around it from -80 to above 32 degrees. Above 32 and below 212 degrees Fahrenheit the water remains in the liquid state. The energy comes from subsurface magma. “We tried to do our due diligence and think of all sorts of alternative factors that could raise the temperature,” Scientist Michael Sori states. “The magma was the only one that did it. None of the other factors really even came close.” Sori and his partner Ali B confirmed that there is volcanic activity near the ice fields because of the particles mixed in the ice cap. The magma alone still wouldn’t keep the water liquid year round. Salt in the water makes it the water maintain a warm temperature all year round. This is how the water keeps warm. In conclusion, there is liquid water under a mars icefield. This water is heated by subsurface volcanic activity and magma. To hold all the heat the water has lots of salt which help maintain it. This helps give the chance for intelligent life to live.